"Motion sickness is the worst, whether you are on a boat, car, plane. It can definitely be an interesting experience. Do you have a funny story or tip on how you beat motion sickness? If so, share your story for a FREE sample of Dramamine." 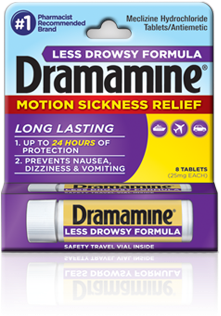 To receive a free sample you must share you story or tip on how you beat motion sickness and fill out your information for a FREE Dramamine sample.